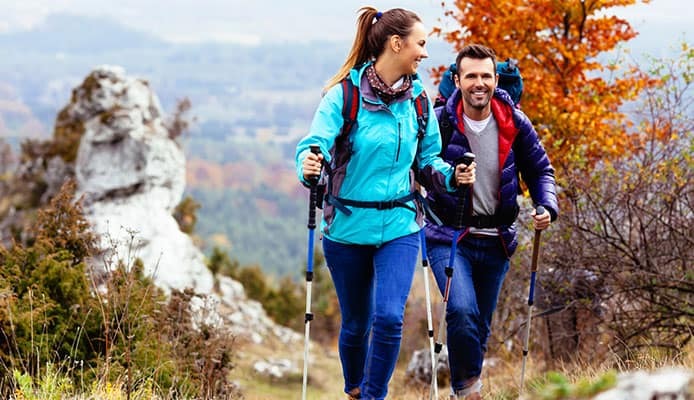 Every avid hiker with miles on the trail under their belt has come to know just how important good hiking pants are to successful and enjoyable excursions. The best hiking pants can make hiking adventures and enhance enjoyment of trips by offering comfort, freedom of movement, and protection from harsh weather elements and from scrapes by rocks and underbrush. The wrong pair can ruin a trip by being a constant source of pain and discomfort or by simply coming apart when exposed to tough conditions. Thus, it is important to invest in the best pants for hiking. Below, we’ve put together a list of what we believe are some of the best hiking and backpacking pants on the market. They are comfortable, protective, high-performing, equipped to withstand highly abrasive wilderness and alpine conditions, and durable. Our buying guide makes it easy to figure out exactly what pair of outdoor pants will serve you best when hiking, backpacking, trekking, or climbing. The 5.11 brand has an established reputation for providing high performing and durable tactical pants. These Taclike pants have all the qualities great pants for hiking should have. They fit comfortably, offer protection on the trail and hold up well. These are lightweight pants meant for warm weather hikes. The heavier fabric also offers warmth while the relaxed fit leaves room for thermal underwear when it is cold. Quality: When it comes to quality, there is nothing to complain about. 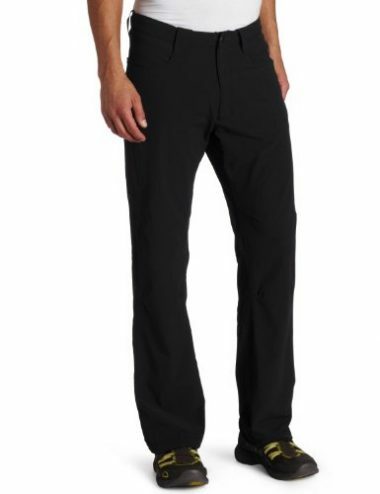 These pants are made of a lightweight ripstop fabric that is a 65% polyester and 35% cotton blend. The fabric is also treated with an HT Teflon coating that resists dirt, grime, and stains and also repels water very well. This together with reinforced stitching, seams, and stress points, and strong YKK zippers ensure long-lasting performance despite constant exposure to rugged terrain and harsh elements. Comfort: The fabric of these pants feels good on the skin. The standard fit is as expected and comfortable. They hold well to the body while being sufficiently baggy where necessary. The length is meant to fit over hiking boots or to sit on top of shoes. A gusseted construction at the crotch allows for a wide range of movement. If you find that you've lost some pounds on the trail, the waistband is stretchy and the wide belt loops allow you to add a belt to ensure that your pants still fit snugly. Features: Easy access storage spaces are in plenty on this pair of pants. 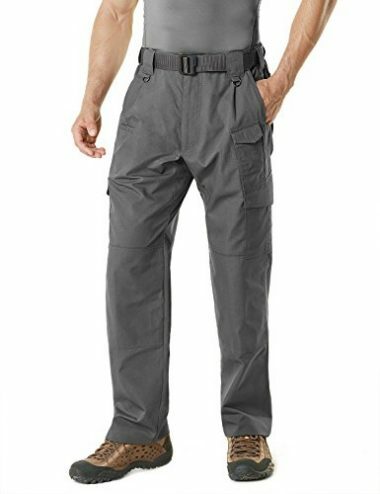 These pants feature deep rear and front pockets, two spacious side cargo pockets, a cell phone pocket, a knife or multi-tool pocket and hip-mounted D-ring. The most impressive feature about these tactical pants by CQR given their quality and performance outdoors is their inexpensive pricing. They are similar in material, quality, features and performance to the 5.11 tactical pants above but accessible to outdoor enthusiasts on a budget. Weighing only 3.2 ounces, adding them to your backpack as a backup pair won't weigh you down. Quality: This is a sturdy pair of pants. The fabric quality and stitching are very good. The fabric is a 65% polyester and 35% cotton rip-stop blend treated to repel moisture and dirt. It resists fading, shrinking and wrinkling and dries quickly. Reinforced knees, snap closure and a closure button enhance the durability. Comfort: The material is lightweight, thin and breathable for comfort in warm conditions. The fit with a long rise, gusseted crotch, and elastic waist is very comfortable and allows for a wide range of movement. The waist is elastic and they have wide belt loops to accommodate a belt. Features: If you love handy storage spaces in your hiking pants, there are storage spaces everywhere on this pair. These pants are equipped with 8 velcro cargo pockets and a front flap pocket. 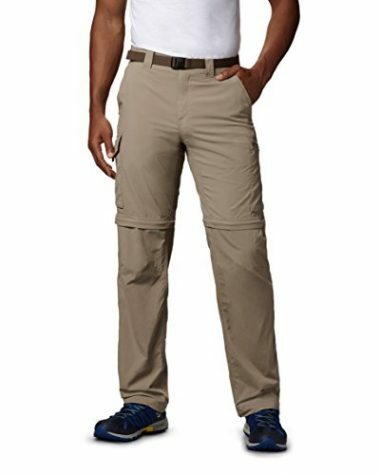 Lightweight feel, zip-off legs, breathability, moisture wicking ability, UPF 50 protection make the Columbia Silver Ridge the best hiking pants for hiking, backpacking, trekking, or safaris in warm and hot weather. The fabric also offers some insulation in spring and fall weather. It also doesn't hurt that this is a stylish pair of outdoor pants. With all these good qualities, there's no questioning why the Silver Ridge pants have so many fans! Quality: Made of polyester, nylon, and mesh, these pants are very lightweight without sacrificing quality and durability. The tight weave offers wind and light rain protection. The fabric is treated with Omni-Shade UPF 50 sun protection factor that shields the skin from the sun's harmful rays. If dosed, they dry quickly and don't wrinkle, fade, or stain. Comfort: The thin and lightweight fabric is comfortable even in the heat of summer or tropical environments. The fabric is breathable and Columbia's Omni-Wick technology ensures that these pants wick sweat moisture very well to keep you cool and dry as you move. The waist is slightly stretchy and they have belt loops. These pants have a classic fit that allows for a full range of movement. Features: One of the best features about the Columbia Silver Ridge is their convertibility. These pants zip off just above the knee to convert into shorts. The lower pant legs have an L and an R stamped on them making converting them back to pants easy and quick. Pockets include one zip-closure pocket, side pockets with hook and loop closure, and mesh pocket bags. 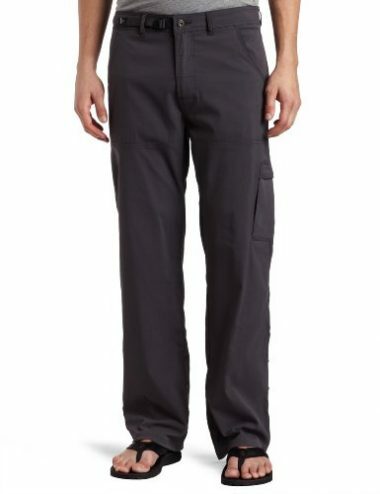 These prAna Stretch Zion pants are super comfortable, extremely rugged, flexible, and stylish. The way they fit, feel, look, and perform in challenging environments have made them favorite backpacking, hiking, climbing, trekking and traveling pants for many outdoor adventurers and these are top rated backpacking pants. Quality: These pants are made of a 97% nylon and 3% spandex performance fabric that is lightweight, flexible, and extremely abrasion resistant. The fabric is quick drying and is treated with a durable water repellent (DWR) finish that causes moisture to roll off rather than soak through. The fabric also offers a UPF 50+ sun protection factors and resists stains and wrinkles. Comfort: Just like their name suggests, the prAna Stretch Zion pants are super comfortable hiking pants. The stretchy fabric offers a stylish slim fit without being restrictive to mobility. The standard fit and gusseted crotch offer sufficient room in the seat and thighs so they don't restrict movement even when climbing. The adjustable waistband and ventilated gusset in the crotch area ensure they breathe well. 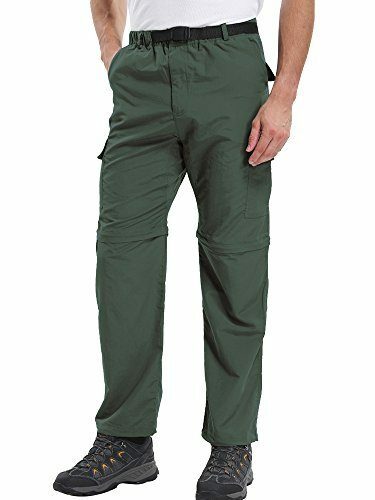 Features: The roll-up leg snaps on these stretchy hiking pants maximize ventilation when it is hot and come in handy when wading across streams. A roomy cargo pocket, two back pockets, and a security flap pocket make up the storage spaces on this pair. Triple stitching construction in key areas and metal waist closure button enhance their durability. If you're looking for an inexpensive pair of lightweight and comfortable pants for hiking or mountain climbing, these hiking pants by TBMPOY fit the bill. The first endearing feature about them is their style. Once you get to wear them, you will love how comfortable they feel too. This particular pair is a type 03 construction that is lightweight and quick drying. It is designed for hiking and mountaineering in the spring and summer and with a light base layer in cool fall weather. If you want more insulation for extremely cold conditions or winter activities such as snowboarding and skiing, you can choose the type 01 and 02 pants that are equipped with a thick fleece lining for warmth and comfort. Quality: The build quality of these pants is great for the price. Made of 97% polyester fiber and 3% spandex, the soft-shell fabric is water repellant and a Windstopper that is very good at blocking the wind and light rain. It is also ripstop tough and abrasion resistant. Comfort: Comfort is one of the strong features these pants have. Due to the spandex composition, these pants have a flexible stretchy fit. The thin fabric is lightweight and breathes well. The adjustable elastic waist and built-in belt make tightening and loosening the fit in response to weight fluctuation easy. Features: Secure and easy access storage spaces include zippered pockets at the sides, front, and back. Every outdoor enthusiast expects quality, durability, value, great fit, and comfort from Columbia. These Pilsner Peak pants don't disappoint. Designed for trail performance, they perform well outdoors, hold up well, and are comfortable to hike, trek, climb or backpack in even in the heat of summer. Quality: The polyester and nylon fabric is thin and lightweight and at the same time strong and tough enough for intense use in the great outdoors. It washes well and resists shrinking and wrinkling. The material repels water well ensuring you don't get soaked in light rain and dries quickly in case it does get wet. If you're hiking in the summer or have sun sensitive skin, you don't have to worry about the effects of the sun's radiation on your lower body as the UPF 50 sun protection treatment has got you covered and protected. Comfort: These pants are very comfortable on the trail. The fabric is stretchy and flexible so it moves with your body and doesn't limit hiking or climbing movements. The fabric is soft, breathable and Omni-Wick moisture-wicking technology allows perspiration to evaporate so you don't get hot and sweaty when participating in exerting activities in warm conditions. The integrated yet removable belt means you can adjust the fit accordingly. Features: Two back pockets and side pockets and a dedicated knife or multi-tool pocket provide convenient storage. As for fit, these pants have a slim-straight cut comparable to that of Levi jeans. The crotch gusset and articulated knees add to the flexibility, comfort, and range of motion. It's hard to go wrong with Columbia hiking pants. With the Cascades Explorer, Columbia offers lightweight and accessibly priced pants for hiking and backpacking in the summer. Weatherproof and tough, these pants are very comfortable and perform very well outdoors enhancing adventures rather than getting in the way. Quality: The material of these pants is a 100% nylon backcountry cloth, which is both lightweight, strong, and a windbreaker. It is very good at repelling wind, light rain, and stains and dries very quickly without wrinkling if soaked through. When the sun is shining hot and bright in the great outdoors, you have nothing to worry about as the UPF 50 sun protection protects your lower body from the sun's harmful radiation. Comfort: Coming from Columbia, comfort is on point. A built-in belt that you can also remove, articulated knees and gusset detail offer a flexible fit that allows for a wide range of motions. The fabric also breathes well so you are able to stay cool and dry even when it is warm and humid. Features: Convenient and functional storage spaces aren't an issue here. The front and side pockets are not bulky at all but still offer a lot of space to put a phone, wallet, keys etc. Hiking pants reviews by both experts and adventurers agree that the Outdoor Research Ferossi pants are some of the best hiking pants there are. Whether you're backpacking, hiking or rock climbing, you will appreciate how comfortable and abrasion resistant they are. They excel at hiking and scrambling in rugged terrain and rocky alpine environments. 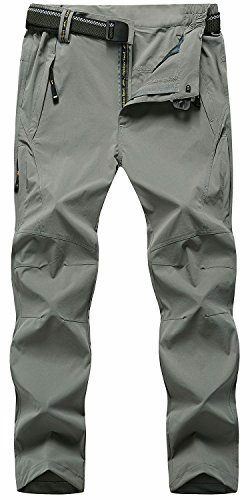 Even without a convertible design, these are amazing multi-season hiking pants that suit summer hikes when its windy to winter adventures with the addition of a base layer underneath. They have everything good outdoor pants should have and they look good too! Quality: The soft shell face fabric is top notch quality. It is a ripstop nylon/lycra blend that is water resistant, wind resistant and quick drying. It offers protection from the wind and light rain. It is tough and excellently abrasion resistant. It withstands rough and rugged alpine and rock environments very well. Comfort: Lightweight, soft, breathable and stretchy, the Ferrosi pants are some of the most comfortable pants for hiking or climbing. They have good articulation that offers excellent flexibility for a wide range of motions when scrambling and climbing. The fabric is airy and moisture wicking so you won't get hot or clammy. Features: The low-profile waist is designed to fit under a harness when climbing. The cinch around the ankles is great for sealing the pants around your boots. The pockets are positioned in such a way that they don't get in the way when hiking. The only gripe is that the front and side pockets are on the small side. If you're looking for budget hiking pants that perform well but don't hurt your wallet, this pair by Jessie Kidden is convertible and inexpensively priced. The comfort, quality, versatility, and outdoor performance are really good making these pants the best value for money. No matter how the unpredictable outdoor weather turns out, these pants have got your covered and protected when hiking and backpacking. Quality: The inexpensive price isn't because these pants are inferior. The overall quality and material are comparable to that of more expensive hiking pants offered by well-known brands. These pants are made of 100% ripstop nylon, which is lightweight, water repellent, and quick drying. As long as you're not exposing them to extremely abrasive terrain or performing extreme gymnastics, these pants do hold up well. Comfort: The waist is elastic for a flexible fit and crotch area is fully gusseted for freedom of movement. They are also breathable and if it gets extremely hot and your legs need a cool breeze, all you have to do is zip off the pant legs so you're wearing shorts. Features: Six pocket configuration offers convenient storage for accessories and other items you need to keep within handy reach. The only complaint about these pants is the size. It is way off and runs pretty small. You may want to order a bigger size for a comfortable fit especially because the fabric doesn't stretch. These versatile multi-season convertible hiking pants by Bienzoe offer incredible value. If you want durable and versatile hiking pants and don't mind a little extra weight, this pair is worth a look. It is perfect for days where the weather is chilly in the morning but gets warmer in the afternoon. These are not completely waterproof hiking pants but the material does a very good job of repelling moisture and dries fast if soaked through. Quality: This is a well-made and sturdy pair of hiking pants that holds up very well. The polyester/cotton ripstop fabric is thick and heavy duty. The zippers are YKK, and the quality of stitches and velcro closures are good. They resist moisture well and offer adequate protection from light rain but they are not fully waterproof. They also dry reasonably quick for their heavier weight. Comfort: The fabric feels comfortable on the skin. The straight leg fit does not hinder the flexibility of movement. The heavier weight makes them suitable for chilly conditions. They are also tolerable in warm weather and the zip off legs are handy in hot days. Features: Another great feature about these pants is the storage spaces. The side, front and back pockets are spacious enough to accommodate larger items. Hiking pants are performance pants and there are certain features they should have in order to fulfill their function on the trail. Each pair will have specific features that make it suitable for certain outdoor conditions and activities and not others. You also have your own preferences when it comes to what to wear when hiking. Choosing hiking pants involves looking at more than just the style, color, and fit. You have to consider how well a pair will serve you depending on the weather conditions you will be hiking in, the kind of terrain you will be wearing it in, and the kind of hiking activities you will be engaging in whether that be rock climbing, trekking, or backpacking. 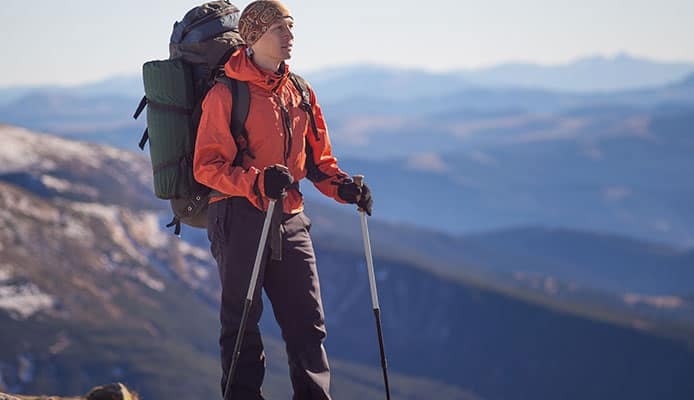 Below are the important features to consider when assessing the quality, performance, and suitability of each pair you’re considering so you can choose the best hiking pants for your type of hiking. The material is the most important aspect of a pair of hiking pants and the first thing to look at when buying hiking pants. It affects the comfort, performance, quality, and durability of a pair. So what’s a good material for hiking pants? It should be tough and abrasion resistant so it doesn’t tear easily when exposed to rocks, tree branches, underbrush, constant friction during movement, and varied weather elements. It should be water, wind, and weather resistant and at the same time breathable, moisture wicking and fast drying. Most hiking pants are made of ripstop nylon or polyester or a blend of these two materials with a small amount of spandex or elastane incorporated to make them stretchy so they move with the hiker and allow for a wide range of movements. Some hiking pants also have some cotton content for warmth and comfort. Cotton and wool are an option for cold weather hikes because of their insulating properties. If you will be hiking in hot and humid conditions, cotton is a no-no. It readily absorbs sweat and moisture but takes a lot of time to dry. You don’t want to be hiking in heavy and damp pants no matter what the conditions are. Proper fit is very important in hiking pants. It is part of what makes a pair comfortable and easy to hike in. Hiking and climbing require a wide range of movement and the pants you’re wearing shouldn’t restrict mobility or rip easily. Fit varies with different manufacturers and even among different pants by the same manufacturer. To ensure you order the right size when purchasing online, take your body measurement and compare them to each pair’s size guide to determine which size to order. Check user reviews to get an idea of whether a pair fits true to size or runs big or small. This will help you decide whether to order the standard size or go a size up or down. Choose the kind of cut that suits the conditions you will be hiking in and also suits how you like your active pants to fit. An athletic cut that maximizes comfort, mobility and trail performance is ideal. Some hiking pants will have a relaxed fit with room for layering while others will have a slim, stretchy fit. Some people prefer to wear leggings when hiking. Too baggy a fit isn’t good for hiking. Such pants will be heavy, keep flapping when blown by the wind and catch on underbrush. Too tight a fit isn’t good either as it will be restrictive, cause chaffing and is susceptible to ripping. Stretchy hiking pants are some of the most comfortable hiking pants. A spandex or elastane composition offers a stretchy fit that moves with you allowing a wide range of motion. As for the fit at the waist, look for features such as the elasticized waists and integrated belt and belt loops. If you want pants for climbing, look for pants with a long rise at the crotch, articulated knees, and the ability to fit under a harness. When you receive your order, wear and test how the pair fits by performing some gymnastics that imitate the kind of movement you will be making when hiking or climbing. This way, you will discover if they don’t fit well and return them before the refund period expires. Sit, raise one knee at a time, do a full squat and hold it. If the pants feel restrictively tight, don’t stay on, split at the crotch, pinch, ride up or down, they are not a good fit and won’t offer a good experience hiking. When the weather conditions allow it, lightweight hiking pants are always a good idea. They breathe well and don’t slow you down on the trail. They are also easy to pack in a backpack as a backup pair for multi-day hikes. The good thing is that most hiking pants out there are lightweight without sacrificing their protective features, quality, and durability. This means that weight won’t be a major issue when choosing hiking pants. For treks, hikes, and climbs in wintery and alpine conditions, thick pants that keep you warm are essential but they will be on the heavy side. Pockets in hiking pants come in handy but are a matter of personal preference. For some adventurers, the more and larger the pockets are the better. For others, one or two pockets are sufficient. No matter what you prefer, you will want to assess the pockets your potential hiking pants offers and their size, design, depths, placement, and closure. Majority of hiking pants have at least two side pockets. For hiking, simple but functional pockets that don’t add bulk are ideal. Look for zippered or velcro pockets to ensure whatever you keep in them stays with you. If you want lightweight and minimalist bottoms, you will want pants with a few pockets. Go for pants with pockets galore if you want to keep a flashlight, compass, multi-tool, map, cell phone, fire starter, snacks, and more items within easy reach. Water resistance is a must-have feature in any kind of outdoor wear. In case it starts drizzling as you hike, you don’t want your pair of pants to turn into a soggy and heavy mess that interferes with your comfort and ability to move. Most hiking pants have some level of water resistance. The nylon and polyester fabrics they are made of are naturally water resistant as they have tight weaves that prevent water from getting in. Some manufacturers also apply a durable water repellent (DWR) treatment to the face fabric. This treatment cause waters to bead up and roll off the face fabric instead of soaking through. This coating wears off with time and requires reapplication when it stops being effective. However, water resistant hiking pants aren’t completely waterproof and won’t stay dry when exposed to a heavy and prolonged downpour. If you’re likely to encounter cold weather and heavy rain – a dangerous combination in the wilderness, we recommend packing a pair of waterproof rain pants to wear over your hiking pants in order to stay dry, comfortable and safe in case the weather turns wet and chilly. Hiking is hard work and an effective way to burn extra calories while having fun. Whether this is one of your goal or an unintended consequence, you’re likely to shed some pounds and find yourself slimmer at the waist after several days of strenuous activities. All of a sudden, pants that fit you perfectly on the first day of the hike need your help to stay up. 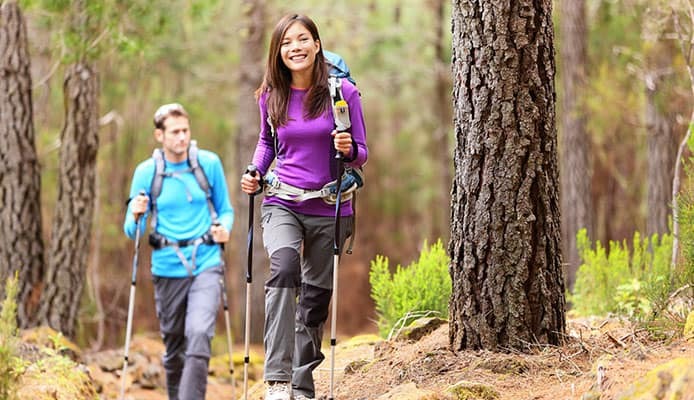 For multi-day hikes, we recommend getting hiking pants that have an elasticized waist, integrated belt, drawstring adjustment, or belt loops to accommodate your favorite belt for hiking. This will allow you to adjust the fit as necessary and keep hiking comfortably and enjoying its health benefits. Unless you want a pair of hiking pants that will turn into a personal sauna in the course of your hike, you will want to ensure that the pair you choose balances abrasion, wind and water resistance with breathability. A fabric that breathes well and wicks away moisture allows excess heat to escape and perspiration to evaporate keeping your cool and dry when hiking in hot or warm conditions. Thin and lightweight fabrics perform the best when it comes to breathability. However, the tight weave hiking pant fabrics have is not very breathable. For maximum comfort when it is hot, go for breathable hiking pants that are also equipped with ventilation features such as mesh-lined zipper pockets, vents behind the knees or in the crotch area, rollable cuffs, and panels you can unzip to let your skin breath. These features will ensure you cool faster and protect you from overheating and getting sweaty and clammy when engaging in strenuous activities in hot weather. Breathability is also important in thick and heavy pants meant for wet, cold and snowy conditions since warmth builds up inside the pants and air flow is essential for comfort. However, venting outlets will be minimal in such pants to ensure they are still effective at blocking the wind, wet and cold. 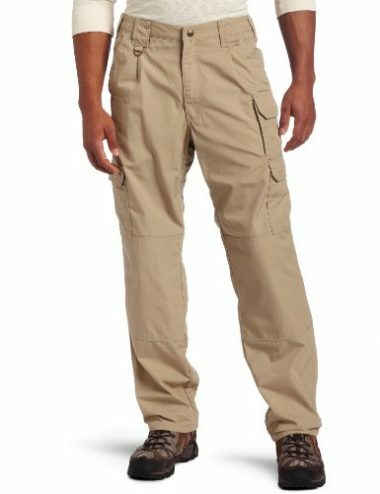 Convertible pants designed with legs that zip off are the best hiking pants because of their multi-season and multi-weather versatility and value for money. They are very convenient for environments where days start off chilly, gradually warm up becoming extremely hot at mid-day before getting cool again in the evening. You can start with full pants, partially unzip the legs for ventilation or zip off the legs completely so you’re wearing shorts when it is hot and sweaty and re-attach the legs when the weather cools down again. If you’re an ultra-lightweight backpacker, convertibles are the best backpacking pants because they are a multipurpose two in one piece of gear. You don’t have to carry pants and shorts separately. Another convenience a convertible pair offers is that when the bottom of the pants gets dirty or muddy, you will be able to wash it without having to remove the whole pants. Convertibility alone isn’t all that’s important. Good convertible hiking pants have zippers that are well made, comfortable and function well and a design that looks good. If you don’t like the zippers, weight, and style of zip-off legs but still want their convenience, consider roll-up pants that feature buttons on the lower leg or elastic in the cuff. In hot temperatures, you just roll them up and use the buttons or elastic to keep them up. Flexibility is one of the qualities good hiking, backpacking and trekking pants should have if they’re to be comfortable and perform as expected. If you’re going climbing or bouldering, flexibility is especially important. To ensure that you choose a flexible pair that enables a wide range of movements, look for features like a gusseted crotch with a long rise, roomy fit at the thighs, a stretchy fabric with spandex or elastane composition and articulated knees. Articulated knees are designed in such a way that they acquire a natural bend in the knee area when a person moves to improve the range of motion. A crotch gusset is an extra fabric placed where a standard seam should be. It offers better fit, comfort, and range of movement. When you receive your pair of choice, you will also want to put its flexibility to the test before you wear it outdoors. Wear your new pants and strike a wide range of poses. Sit, squat, lift your knees one at a time the way you lift them when climbing, and strike some yoga and gymnastic poses. If the pants move with you, allow a wide range of movements and don’t feel restrictive you can keep them. If they feel constricting around the knees, thighs, hips, or crotch, split in the crotch, pinch, ride up or down, or limit mobility, your search for the best hiking pants isn’t over. Quietness is an important feature that is easy to forget to consider when evaluating hiking pants. A constant swishing noise accompanying your every move can get very annoying in the great outdoors where it is quiet and you’re moving all the time. Always check the user reviews of your potential hiking pants to see if there are any complaints of them being noisemakers in the wilderness. Most hiking pants including the pants in our hiking pants reviews are constructed of fabrics that don’t make noise. You can move stealthily while enjoying the serenity of nature. When hiking, backpacking or climbing, there are all kinds of elements you want to keep off your skin: wind, rain, cold, the sun’s harmful rays, twigs, rocks, underbrush, mosquitoes, and bugs. The best hiking pants should be able to handle the kind of conditions you hike in, protect your lower body and keep you comfortable in a variety of terrain and environments. Look for pants made of a ripstop tough fabric with water resistant and wind breaking properties. Long pants are the most protective because they offer full coverage. When hiking in rugged and alpine conditions when it is inevitable that you will rub against abrasive elements, the pant fabric should be ripstop tough to resist tearing and protect your skin from scrapes and abrasions by branches, thorns, and rocks. Because of the tight weave in their fabrics, all hiking pants offer some protection from the sun’s ultraviolet rays. If you have very fair skin or tend to burn easily when exposed to the sun, you will need a higher degree of sun protection such as the one offered by hiking pants made of a fabric with a UPF 50 ultraviolet protection factor. Those hiking at high altitudes, in tropical regions, in the summer, in reflective snowy conditions, or in desert environments where the sun shines intensely and directly will also benefit from this high level of sun protection. Full-length pants hide your legs from mosquitoes and insects. If you will be hiking in heavily infested areas, you may want to look for pants that have a bug repellent treatment so bugs will avoid you instead of you hiding from them. In addition to being water resistant and repellent, good hiking pants are also made of a quick drying material. This ensures they dry fast after a downpour or a creek crossing and keep you dry, warm and comfortable. When your hiking pants are fast drying, you won’t hesitate to enjoy a refreshing swim when you come across an inviting river or pond. You can also wash your pants if they get dirty without worrying that you won’t have something to wear come morning. Nylon and polyester fabrics are very good at resisting water absorption and also dry very fast. Cotton is the worst when it comes to drying performance. It readily soaks in water and then takes its time to shed it off. Q: What Are Hiking Pants And Why Do I Need One? 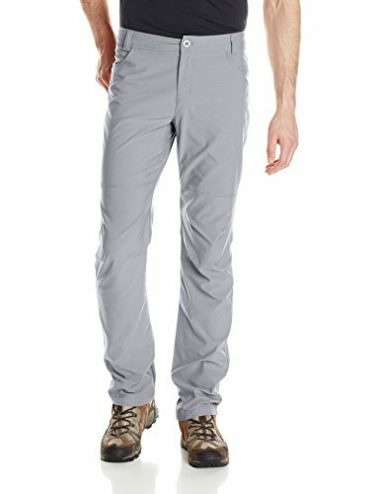 A: Hiking pants are specialty outdoor pants designed for performance and comfort when hiking. When you’re going to be hiking, trekking, backpacking or climbing in the wilderness exposed to all kinds of harsh weather elements and rugged terrain and vegetation, regular pants or leggings won’t do. You need hiking pants because they are lightweight and flexible, tough and abrasion resistant, weather resistant, and breathable. They will protect you from all kinds of elements in the great outdoors and ensure that you’re comfortable and can enjoy your favorite outdoor activities. Since they are equipped to withstand the rigors of hiking, abrasive alpine environments, and harsh outdoor elements, they will also offer long lasting service on the trail where regular pants won’t hold up. Q: What Type Of Hiking Pants Are Best For Short Summer Hikes? 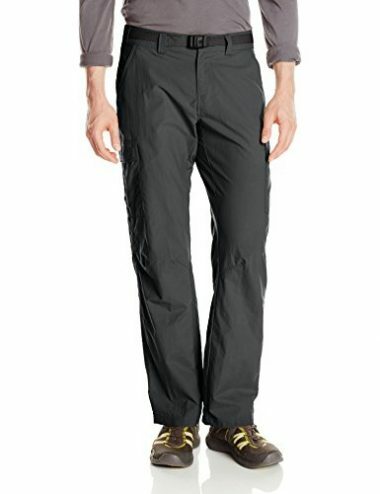 A: For short summer hikes, a hiker needs pants that are lightweight, comfortable and will keep them cool and dry. The best hiking pants for short summer hikes are made of a thin, lightweight, breathable, and moisture-wicking fabric. This ensures the hiker stays dry, cool and comfortable. It should still be a ripstop quality fabric with the ability to resist abrasions. Convertible pants that can be converted into shorts when it gets too hot and sweaty are also a great choice. Pants made of a material with a UPF 50 sun protection rating offer a high degree of protection from the sun’s harmful radiation, which is very important in the summer sun especially if you have very fair skin that gets sunburnt easily. Short hiking expeditions may not require carrying a backpack. In this case, plenty of pockets will offer storage spaces for essentials. Q: Can Hiking Pants Be Worn With Other Layers Of Clothes? A: Yes, most hiking pants are cut and sized to offer a relaxed fit for comfort, flexibility, and also to accommodate layering. If you’re hiking in cold conditions or going up in elevation, you can add a base layer such as thermal underwear or tight underneath your hiking pants in order to stay warm and comfortable. If chilly and wet conditions, you can also wear a pair of waterproof rain pants over your breathable hiking pants and base layers. What you wear when hiking, backpacking, rock climbing or mountaineering determines how your adventure will turn out. Given that your legs are the part of your body you use most when participating in these activities, the pants you wear are especially important. If you want to enjoy your hikes to the fullest, good hiking pants that fit well and suit your style of hiking and the kind of conditions you hike in are essential. They should be comfortable, breathable, water and wind resistant, quick drying, flexible enough to support a wide range of hiking or climbing motions, and tough enough to resist abrasion by shrubs and rocks. The best hiking pants are an investment. They become a reliable go to for comfort, freedom of movement, protection, and performance on the trail. They also suit a variety of outdoor activities and casual situations from traveling, running, working outside, to running errands. Since they are constructed tough to withstand hard use, they will last for years and offer the best value for your money. Which of the hiking pants on our list is your top choice? We would love to read your thoughts or experience with the pants for trekking, hiking, and backpacking we’ve reviewed! Feel free to share in the comment box below.